The origins of videotape are covered in the Beginnings section, but, before that the only way to record televion pictures was on film. In the 21st Century this method is glibly referred to as pointing a camera at a television set, but there was an awful lot more to it than that. Film Recording was the official title for the department and, along with Telecine (the playback method) they became part of Television Recording Department, including videotape following its introduction in late 1958. 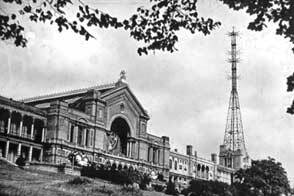 BBC Television began before the Second World War at Alexandra Palace, moving in the 1950s to Lime Grove Studios as a temporary home while Television Centre was built. This period provides a fascinating link between the world of pre-war television and that of the VT Oldboys.Luckily this era was documented in a website (Direct Television for Alexandra Palace) by Arthur Dungate who joined the BBC in 1952 in Central Telecina at Alexandra Palace. I never actually met Arthur apart from by email several years ago and for several years we carried a link to his website. A couple of years ago I began to receive reports of a failed link to the site and, after investigation, realised it had disappeared without trace. Howard (Dell) and I have tried to track down Arthur and the site but met with failure until, in September 2008, thanks to John Dickenson, we discovered the Internet Archive Project. This project has been archiving the Internet(!) since the late 1990s and I managed to find a version of the AP site that was,probably, 75% intact. I managed to aquire a nearly identical domain name to the original, re-formatted the pages and adjusted the navigation. 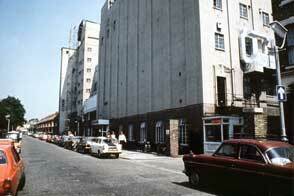 Just before Christmas 2008 I was contacted by Nigel Finnis who documented the demolition of Lime Grove (see under Lime Grove on the main menu), and Patrick Collins who saved a copy of the site in 2002. Finally, at the start of 2009, I received a copy of the original website on CD from Arthur himself, and that is what you now see. Additionally, with the recent colour restoration of an episode of "Dad's Army" from a Black & White film recording, it is about time that we provided more information about this decade of Television Recording. Just before HM The Queen's Diamon Jubilee we borrowed a copy of the official book that recorded the BBCs preparations for the Coronation. It has been scanned and you can download the pdf below. This version is a compressed file - if you want a 'best quality' version (and have the patience) it is available in Downloads.